The Hodge Silk Bari Sax Swab The silk baritone saxophone swabs are uniquely designed to swab out the circular part of the body after each playing session. This swab is designed to keep this area clean and to keep gunk from building up. It is a foam covered flexible snake, 24 inches long and the diameter of the bore of the circular section of the saxophone, with a silk covering which quickly absorbs the water that has accumulated. This swab is pushed into the top of the saxophone and around the loop and then pulled back out removing the moisture. The neck is cleaned similarly. 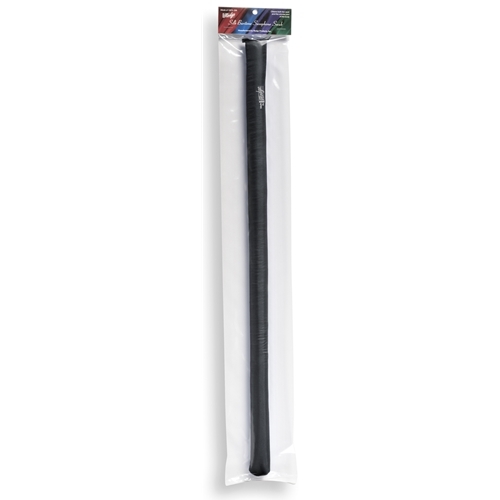 Key Features Pure Silk Covering Absorbent No Lint Foam Tube Stainless Steel Snake Inside The Qualities of Silk All Hodge silk swabs are made from 100% silk and come in performers black, royal blue, burgundy, forest green, and deep purple. Silk is very absorbent, soaking up water in instruments better than any other natural material on the market, including both cotton and chamois. In addition, silk is lint free.